In these Booking Conditions “you” and “your” means all persons named on the booking (including anyone who is added or substituted at a later date) or any of them. “We”, “us” and “our” means Family Ski Company Limited. These Booking Conditions only apply to holiday arrangements which you book with us in the UK and which we agree to make, provide or perform (as applicable) as part of our contract with you. All references in these booking conditions to “holiday”, “booking” and “arrangements” mean such holiday arrangements unless otherwise stated. References of “departure” means the commencement date of the arrangements you book with us. We will reserve your holiday by telephone and advise you verbally how long we will hold your reservation before your deposit must be received. The party leader is responsible for making all payments to us. Deposits are not refundable, except under the provisions of Clause 8 ‘Changes & Cancellations by us’. You may pay your deposit by sending a cheque or by sending, emailing, or telephoning your credit or debit card details. The party leader must send or email the signed and completed Booking Form to us as soon as possible. He/she must also be sure to sign the Insurance Indemnity on the Booking Form. On receipt of your signed and completed Booking Form and all appropriate payments, we will issue a Confirmation Invoice. NB: In the event that we do not receive your completed Booking Form within 7 calendar days of your deposit being received, we reserve the right to send you a Confirmation Invoice based on our best understanding obtained at the time of reservation over the telephone or by email of the services that you require during your holiday. You will also be deemed to have agreed to these Booking conditions and the Insurance Indemnity. Please check your Confirmation Invoice as soon as you receive it and notify us within 14 calendar days if you believe there are any errors or omissions as it may not be possible to make changes later. Confirmation invoices are subject to amendment for clerical errors and omissions. If you have not received your confirmation Invoice within 14 days of making payment, please contact us to make sure that your booking is confirmed. A binding contract between us comes into existence between you and us on the date of issue shown on our Confirmation Invoice. We both agree that English law (and no other) will apply to your contract and to any dispute, claim or other matter of any description which arises between us (except as set out below). We both also agree that any dispute, claim or other matter of any description (and whether or not involving any personal injury) which arises between us must be dealt with by the Courts of England and Wales only unless, in the case of Court proceedings, you live in Scotland or Northern Ireland. In this case, proceedings must either be brought in the Courts of your home country or those of England and Wales. If proceedings are brought in Scotland or Northern Ireland, you may choose to have your contract and any dispute, claim or other matter of any description which arises between us governed by the law of Scotland/Northern Ireland as applicable (but if you do not so choose, English law will apply). We are no longer in a position to sell insurance policies. However all persons named on the Booking Form and Confirmation Invoice must have adequate travel insurance to cover in particular the cost of cancellation, medical expenses and repatriation in the event of accident or illness. Please also make sure your policy covers you for all activities you will be undertaking whilst on holiday. You must also indemnify us against all liabilities, costs and consequences that may arise as a result of you not being adequately insured. As stated in Clause 1, you must sign the Insurance Indemnity on the Booking Form. If you have any special requests, for example special dietary requirements or ‘special needs’ childcare or any other special requirement such as a cake on a child’s birthday, we will do our utmost to provide such requirements or services, but you must discuss these with us at the time of your telephone or email booking enquiry. If we feel unable to provide any such special services we will normally inform you verbally of this immediately, although we may need to make further enquiries before confirming whether or not we can provide such services. You must also confirm such special requests on the Booking Form or in a letter accompanying your Booking Form, or by letter if making such requests when you have already sent in your completed Booking Form. This ensures that any descriptions, agreements and assurances given verbally are properly documented and therefore correctly actioned. Please note – confirmation that a special request has been noted or passed on to the supplier, or the inclusion of the special request on your confirmation invoice (or any other documentation) is not confirmation that the request will be met. Unless and until specifically confirmed all special requests are subject to availability and are not guaranteed. If you have any medical problem or disability which may affect your holiday, please tell us before you confirm your booking so that we can advise as to the suitability of the chosen arrangements. In any event, you must give us full details in writing at the time of booking. The balance of your holiday cost will be shown on your Confirmation Invoice and must be paid at least ten weeks before your scheduled departure date. If a booking is made within this period the full amount will be payable immediately. If you fail to pay the balance by the due date and fail to respond immediately to requests for payment, we reserve the right to treat your booking as cancelled by you. You will then be liable to pay cancellation charges under the provisions of Clause 7 below. We also reserve the right to apply a late payment charge of £20 per day payment is overdue per booking. We do not normally discount holidays, but reserve the right to do so. It is therefore possible that you might be sharing accommodation with guests who have paid a lower price. We reserve the right to make changes to and correct errors in advertised prices at any time before your holiday is confirmed. We also reserve the right to introduce a currency surcharge formula applicable to the price of your holiday at any time before your holiday is confirmed. We will advise you of any error of which we are aware, the then applicable price and details of any applicable currency surcharge formula at the time of booking. We will, whenever possible, endeavour to make changes or additions to your booking on request, but are not under any obligation to do so. You will be liable for any expense incurred by us and any charges or expenses incurred or imposed by any of our suppliers in making any such changes. Such amounts will be shown on your revised Confirmation invoice. You will not normally be liable for any administrative amendment fee, but we reserve the right to charge up to £30 per party member in the event that, in our opinion, too many requests for changes are made by a single family or party. We must be informed in writing if you wish to cancel your holiday. The following charges apply based on the date we receive your written notification. Where the cancellation charge is shown as a percentage, this is calculated on the basis of the total cost payable by the person(s) cancelling excluding amendment charges. Amendment charges are not refundable in the event of the person(s) to whom they apply cancelling. We start planning the holidays we offer many months in advance. Occasionally we have to make changes to and correct errors in brochure and other details both before and after bookings have been confirmed or cancel confirmed bookings. Whilst we always endeavour to avoid changes and cancellations, we must reserve the right to do so. chosen to accept the changes. Please note, the above options are not available where any change made is a minor one. Depending on the option that you choose, we will issue a revised Confirmation Invoice, or a Credit Note together with the relevant refund, as appropriate. If we have to make a significant change or cancel less than 70 days before departure, we will, where appropriate, pay the compensation set out below depending on the circumstances and when the significant change or cancellation is notified to you subject to the following exceptions. Compensation will not be payable and no liability beyond offering the above mentioned choices can be accepted where we are forced to make a change or cancel as a result of unusual and unforeseeable circumstances beyond our control, the consequences of which we could not have avoided even with all due care. No compensation will be payable and the above options will not be available if we cancel as a result of your failure to comply with any requirement of these booking conditions entitling us to cancel (such as paying on time) or if the change made is not significant. The scale of compensation per person is based on the number of days between forwarding notification to the Client who signed the Booking Form and the scheduled departure date as follows: more than 70 days – nil, 69-29 day – £30, 28-15 days – £40, less than 14 days – £50. These compensation figures will be reduced for children by the relevant percentage discount that was applied to their accommodation price. Except where otherwise expressly stated in these Booking Conditions, we regret we cannot accept liability or pay any compensation where the performance or prompt performance of our obligations under our contract with you is prevented or affected by, or you otherwise suffer any damage or loss (as more fully described in Clause 17(2) below) as a result of, “force majeure”. In these Booking Conditions, “force majeure” means any event which we or the supplier of the service(s) in question could not, even with all due care, foresee or avoid. Such events may include (but are not limited to) the threat or occurrence of any of the following: war, riot, civil strife, terrorist activity, sickness, quarantine, industrial disputes, natural disasters, fire, technical problems with transport, closure or congestion of airports or air space, train stations or ports, adverse weather conditions, landslide or avalanche danger and all similar events outside our control. We do not sell flights. We may however assist our Clients in finding flights through Agents with whom we work. If we make a flight booking for a Client it is understood that the Contract for flight purchase is between the Client and the Agent or Flight Supplier, and payment must be made direct to the Agent or Flight Supplier. No contract for flight supply shall exist between the Client and Family Ski Company Ltd.
We have no control over the operation of flights and other public transportation, and cannot accept any responsibility or liability for any technical or other operational problems. Please allow plenty of time for flight and train departures, etc., as we cannot accept responsibility for the consequences of missed transfers. If you have booked transfers with us between airports, train stations and our resorts and your flights arrive later than the specified times of which you have been advised for which your transfers are valid, you may have to pay for private or public taxi transfers at the prices quoted at the time. Therefore, although we will use our best endeavours to give you practical help and advice to reduce where possible the costs of such transfers to you, we strongly advise you to ensure your travel insurance covers missed connections and transfers. If you have booked transfers with us we will advise you of the time of your departure transfer at the end of your holiday, but we cannot accept responsibility or liability if your party is not ready to depart at the specified time and consequently misses any flight or other transportation departure, although we will still do our best to get you there in time subject to adhering to normal standards of road and passenger safety. We will also not be liable for the consequences and costs to any Client due to any delays occurring as a result of Force Majeure, as defined in Clause 9: please note that this also includes unexpectedly adverse traffic conditions which we could not have foreseen. 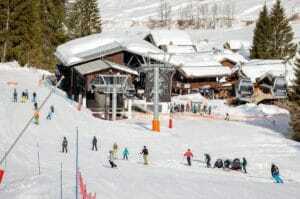 Our chalets and resorts are chosen for their location and suitability for family skiing holidays. 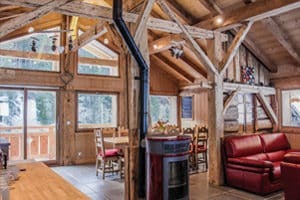 Chalets in perfect locations with ideal facilities and room specifications are extremely hard to come by, and a degree of compromise has to be accepted. 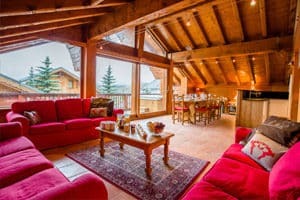 Indeed, the family skiing holiday chalet that is perfect in absolutely every respect probably does not exist in the Alps. Alpine standards of room space, ceiling heights, cooking facilities, hot water supply, plumbing and electrics can sometimes require a degree of tolerance to be exercised. We cannot guarantee and indeed it is almost impossible, to keep accommodation spotlessly clean, particularly access areas such as hallways and staircases, due to the constant comings and goings of people, particularly children, into and out of chalets. We try to ensure that our chalets are child-friendly, but it must be remembered that most chalets are rented and the owners do not always allow us to make all the changes that we would like. 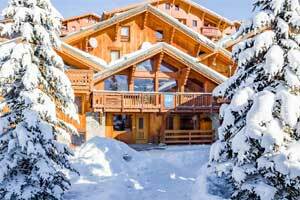 In some chalets there are steep staircases unsuitable for very young children and floors in French chalets are often tiled and smooth, there are also hard and sharp or hot surfaces such as around fireplaces. Parents should familiarise themselves with potential hazards, take all sensible precautions and supervise children at all times. Please ask at the time of booking, if you have any concerns. Please note safety is of the utmost importance: Jacuzzis and Hot Tubs, (hereinafter referred to as ‘Hot Tubs’) can be dangerous if used without due care and attention. Children under the age of 16 years wishing to use the Hot Tubs must have adult supervision at all times. All persons using the Hot Tubs do so at their own risk. Instructions for the use of the Hot Tubs will be displayed in each chalet, and we cannot stress strongly enough the importance of being aware of and abiding by these instructions. In particular, we ask all persons to shower before entering the Hot Tubs and not to use any shampoos, soaps, or gels, since the use of these often cause problems with filtration and water purity and often result in closure of the Hot Tubs for deep cleaning and maintenance. Drinking of alcohol is not recommended when using the Hot Tubs and the use of any glass container is forbidden. Please note that Hot Tubs are often, but not always, deep cleaned on arrival and departure days and therefore may not be available for use on such days. Please also note that Hot Tubs have many pumps, motors, blowers, and filtration equipment and from time to time any of these components can fail, thereby resulting in the closure of a Hot Tub. Such events are by definition outside our control and whilst we will use our best endeavours to bring the Hot Tub back into service as quickly as possible, it is sometimes impossible to get service immediately. In this situation we will not be liable to pay any compensation due to any Hot Tub being out of service. Please note that, under French Law, we understand that it is not permitted for anyone under the age of 16 years to enter a Sauna. In the event that a Sauna is out of service for an operational reason beyond our control, we will use our best endeavours to bring the Sauna back into service as soon as possible, but we will not be liable to pay any compensation due to any Sauna being out of service. 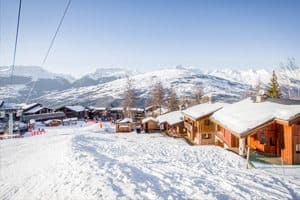 Please note that Wifi in the mountains is not always reliable, especially under the strains of multiple connections in a chalet. We do ask guests to help each other by avoiding data-hungry web use. Whilst we will do our best to bring any internet connection back into service as quickly as possible, we cannot guarantee that this will be possible, and we will not be liable to pay any compensation due to any Wifi connection going or being out of service. Where we make or take a booking from you for ski lessons we do so as agent for the ESF (or other applicable ski lesson provider). 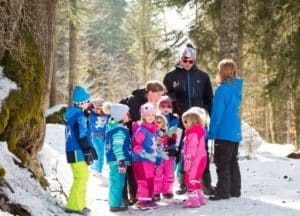 Normally the ESF provides children’s ski lessons in all our resorts. Please note that the ESF is not a company and therefore not a legal entity. All Ski Instructors working with the ESF in each resort are effectively self-employed persons. We have no control over which Instructor will be allocated to lessons attended by children that we book with the ESF on your behalf. 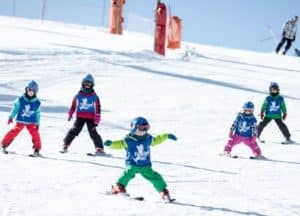 We have no control over the ski lessons, the ESF or other ski lesson providers and we cannot accept any liability for the lessons provided by or for the acts or omissions of the ESF or other ski lesson provider or any of their employees or other personnel (including ski instructors). Where we make or take a booking from you for lift passes, ferry crossings, train travel and/or car hire we do so as agent for the lift company, ferry company, train company and/or car hire company (as applicable). We have no control over the provision of the lifts/lift company or the ferry/ferry company or the train/train company or the car hire/car hire company and we cannot accept any liability for the lift transportation, ferry, train or the car hire itself or for the acts or omissions of the companies or any of their employees or other personnel. Where we take a booking from you for transfers (for example between your resort and the airport) in vehicles which are not leased by us or driven by our drivers we do so as agent for the transfer company (as applicable). We have no control over the provision of those transfers or the transfer company and we cannot accept any liability for those transfers or for the acts or omissions of the transfer company or any of their employees or other personnel. Ski lessons, lift passes, lift transportation, ferry crossings, train travel, car hire and the transfers mentioned above do not form part of your contract with Family Ski Company and our acceptance of liability set out in Clause 17(1) does not apply to these services. 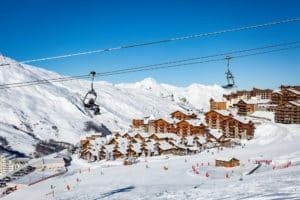 Your contract will be with the ESF or other ski lesson provider, lift pass, ferry, train, car hire and/or transfer company (as applicable) and the terms and conditions of the supplier concerned will apply to that contract. In the event however that we are found liable in any respect for any of these services (for example in our capacity as booking agent), that liability is limited to the cost of the particular service concerned. We do not limit or exclude our liability for death or personal injury arising from our negligence or that of our employees. Please note: If you experience any difficulties with ski lessons booked through us, you should contact our Ski School Helper or Resort Manager immediately that you perceive a problem and he or she will do their best to assist you to resolve the problem. We normally have a very good relationship with the ESF in each of our resorts and we are often able to assist to resolve difficulties to everyone’s satisfaction, but you must accept that we cannot guarantee this. Any assistance provided to you in relation to any complaint you may have concerning ski lessons, transfers or lift passes booked through us is provided on a goodwill basis and in our capacity as agent only. transfers booked through us is provided on a goodwill basis and in our capacity as agent only. We do not limit or exclude our liability for death or personal injury arising from our negligence or that of our employees. We expect our Clients to behave courteously and show consideration for other Clients and our members of staff. We reserve the right, at our absolute discretion, to terminate your holiday if we have reason to believe that your behaviour is unreasonable or likely to cause distress, danger, or annoyance to any of our Clients, members of staff, or any of our suppliers or other third parties. In the event that we exercise our reserved right our responsibility and liability to you will cease immediately and we will not be liable for any consequent costs or expenses that you may incur (including any alternative accommodation arrangements), nor will we pay any refunds or compensation. Responsibility and liability for meeting the cost of rectifying any damage that you may cause to ours, or to our suppliers’, or to other third parties’ equipment or property will be yours. You indemnify us against any claims arising from third parties and any legal costs arising from such damage. Please note: our acceptance of liability set out in this Clause 17 does not apply to ski lessons, transfers, lift passes, lift transport, ferry crossings, train travel and car hire . See Clause 14 for further details. (1) We promise to make sure that the holiday arrangements we have agreed to make, perform or provide, as applicable, as part of our contract with you are made, performed or provided with reasonable skill and care. This means that, subject to these booking conditions, we will accept responsibility if, for example, you suffer death or personal injury or your contracted holiday arrangements are not provided as promised or prove deficient as a result of the failure of ourselves, our employees, agents or suppliers to use reasonable skill and care in making, performing or providing, as applicable, your contracted holiday arrangements. Please note it is your responsibility to show that reasonable skill and care has not been used if you wish to make a claim against us. In addition, we will only be responsible for what our employees, agents and suppliers do or do not do if they were at the time acting within the course of their employment (for employees) or carrying out work we had asked them to do (for agents and suppliers). (3) Please note, we cannot accept responsibility for any services which do not form part of our contract. This includes, for example, any additional services or facilities which your hotel or any other supplier agrees to provide for you where the services or facilities are not advertised inour brochure and we have not agreed to arrange them as part of our contract and any excursion or activities you book in resort. In addition, regardless of any wording used by us on our website, in any of our brochures or elsewhere, we only promise to use reasonable skill and care as set out above and we do not have any greater or different liability to you. (4) The promises we make to you about the services we have agreed to provide or arrange as part of our contract – and the laws and regulations of the country in which your claim or complaint occurred – will be used as the basis for deciding whether the services in question had been properly provided. If the particular services which gave rise to the claim or complaint complied with the local laws and regulations applicable to those services at the time, the services will be treated as having been properly provided. This will be the case even if the services did not comply with the laws and regulations of the UK which would have applied had those services been provided in the UK. The exception to this is where the claim or complaint concerns the absence of a safety feature which might lead a reasonable holiday maker to refuse to take the holiday in question. (5) Where we are found liable for loss of and/or damage to any luggage or personal possessions (including money), the maximum amount we will have to pay you is £1000 per person affected. For all other claims which do not involve death or personal injury, if we are found liable to you on any basis the maximum amount we will have to pay you is twice the price (excluding any amendment charges) paid to us by or on behalf of the person(s) affected in total. This maximum amount will only be payable where everything has gone wrong and you have not received any benefit at all from your holiday. (6) Please note, we cannot accept any liability for any damage, loss, expense or other sum(s) of any description (1) which on the basis of the information given to us by you concerning your booking prior to our accepting it, we could not have foreseen you would suffer or incur if we breached our contract with you or (2) which did not result from any breach of contract or other fault by ourselves or our employees or, where we are responsible for them, our suppliers. Additionally we cannot accept liability for any expenses or losses which relate to any business (including self employed loss of earnings). Please note, the information and prices shown on our web site may have changed by the time you come to book your holiday. Whilst every effort is made to ensure the accuracy of information on the website, regrettably errors do occasionally occur. Floor plans in particular are indicative and not necessarily to scale or fully accurate in all details. You must therefore ensure you check all details of your chosen holiday (including the price) with us at the time of booking. Please note that we reserve the right to change any of the above Terms & Conditions, always provided that we inform you of any such changes at the time of your booking. We will confirm any such changes to you in writing either before or at the time we send out your Confirmation Invoice if you decide to proceed with your booking. Please note, it is the requirements and standards of the country in which any services that make up your holiday are provided which apply to those services and not those of the UK. As a general rule, these requirements and standards will not be the same as the UK and may sometimes be lower. We are fully bonded with ABTOT, the Association of Bonded Travel Organisers’ Trust. This arrangement means your money will be refunded in the unlikely event of our being unable to provide your holiday due to our insolvency.